Ten hours seems to be the Ironman equivalent of the three hour marathon. Just as my first major goal in distance running was to break three hours (Taunton 2005) when I moved on to Ironman ten hours was there in my mind. As barriers they represent an attainable point of performance for the dedicated athlete. Not requiring quite the same focus as a 2:40 marathon or sub 9 hour Ironman, but equally not a time achieved by the odd bit of training. They’re both clear indicators that an athlete has put in a reasonable amount of work into their preparation. Inspired by a recent thread on the Tritalk forum I thought I’d look at what was involved in my first sub 10 Ironman and see what could be learnt from it. My initial memories were of long hours of training around work and a commute. In fact my recollection was of 20-25 hour weeks as the norm. 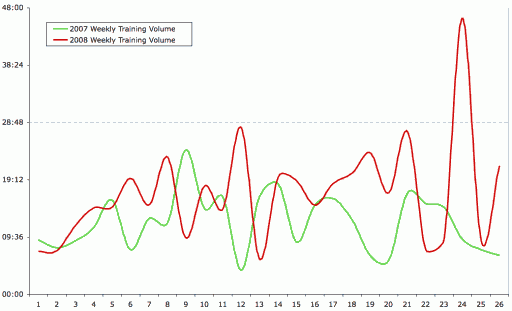 Digging through old files I found a spreadsheet of training volume for 2007. The average was a little over 12 hours with peak around 18 hours in the lead in! Significantly less than expected. I logged everything in WKO+ from 2008 onwards and soon discovered my recollection was of my second season of Ironman racing where I increased the volume and weekly training load. Even then the average was a 17-18 hour week, but with peak weeks typically around the 25 hour mark. Also notably were some training camps consisting of major volume – Epic Camp Italy represented a 45 hour training week! Given it took a lot less training than I assumed it makes sense to consider what kind of athlete I was at the start of 2007. I came to triathlon from a couple of years running with a marathon PB of 2:50 at Taunton. At that time I was very light, around the race weight I aim for now. Running was a strength and I took advantage of this in tri by doing minimal training to maintain it. I’d learnt to swim as a child, but not to a high level so much of my training time was about becoming a reasonable swimmer. Similarly I’d only owned a road bike for two years and was still developing as a rider. 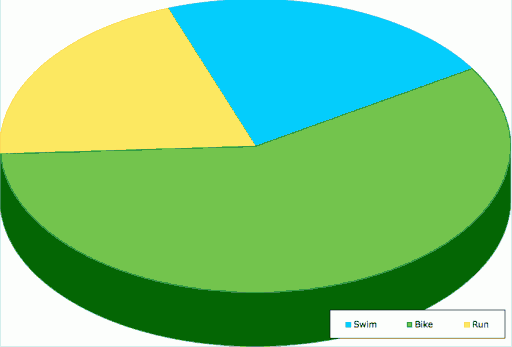 The pie chart shows the division of training time leading to Austria. You can see how little running was emphasised. I really relied on that run history to carry me through. The time I saved there was ploughed into trying to improve my swim mostly via a Masters Squad and drills during my own time (in a horrible 20m gym pool). The vast bulk of training time was spent on the bike though. In terms of swimming the main thing I needed was to be no slower than 1:10, but the faster the better. By the time Austria came round I was at best a one hour Ironman swimmer, but very reliant on a draft for that. During the race I happened to get that draft and got dragged round to a good swim time. I’d had about 18 months of decent swim training as that point based off at least knowing correct technique from my childhood. I had the ability to run well on very little training. A typical week even at my peak consisted of a long run of 90-120 minutes, a 30 minute brick run after a threshold session and one more easy 30 minute run. I did no speed work or focussed sessions during this time. However I regularly raced throughout the season and my regular training pace would represent a 3:25 marathon at its slowest. Biking was where I really focussed time. I knew it was a weakness and like many runners found it hard to deal with the ‘pain’ involved. I could race a hard 5km run without concern, but something about biking as hard hurt. The importance of a good bike was obvious so I worked at it. The typical training week contained a long bike at the weekend, a threshold or interval session mid-week, a tempo ride and possibly a fourth easy ride. My long rides were dictated by feel and I never felt I worked that hard during them. Tempo and interval sessions utilised power (once I had a power meter) or heart rate and I tended to be very strict in my numbers. Aside from those two sessions any further intensity came during races. Effectively I had four sessions a week in each sport. For swimming two were squad based and intense and the rest were easy. For cycling I had one endurance ride up to and occasionally beyond Ironman distance and one properly hard session a week. Running is the odd one out as I only ever ran hard when I was in a race, the rest of the time I’d be close to my expected Ironman pace. 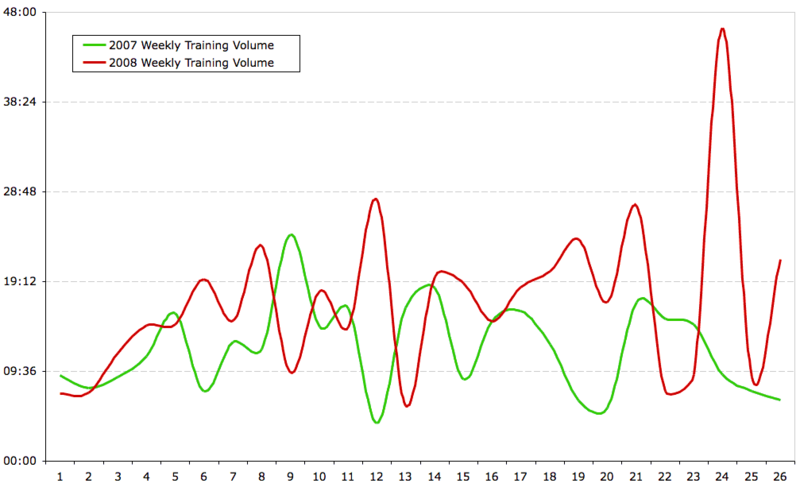 Scattered throughout the year were a couple of big training weekends. Where I went away and did much higher bike volume usually. Running remained on the back foot and with swimming outside of the squad I just ensured frequency. I think these small blocks of over reaching were significant in helping my Ironman bike performance. When I came to the race I didn’t go in planning to break 10 hours. I was aware of the possibility, but was aiming for 10:30. I was lucky with my swim performing to the best that could be expected and getting the perfect draft. The bike felt far too easy, though perhaps I pushed the pace a little and recall feeling it a bit by the end. I have some power data (from an Ergomo) which I’ll have to compare that with recent results. I recorded a 5:12 on the bike and left myself with 3:45 to complete the run. Easy! It turned out the run would be where I’d make my big mistake. Thirty kilometres at three hour marathon pace worked well until the wheels came off. There was a lot of walking in the last 10km and had I not given myself a huge buffer I’d not have broken ten hours. As it was time was with me and I ran a 3:26 with about 25 minutes walking in the final quarter. I finished the race in 9:46 comfortably under the 10 hour mark. Considering the path I took to Austria I consider a few factors particularly important. Firstly I’d achieved a level of fitness or performance in each of the sports that meant I was comfortably able to race suitable splits for the sub 10 hour mark. It’s also worth mentioning that Austria is a fast course and helped me along the way. I’d not planned sub 10, but had trained for it whether I knew it or not. I had a big advantage being able to suffer to a 3:26 Ironman marathon on an average of 2.5 hours running per week. This freed time to focus on improving bike and swim so I worked harder in both those areas. Being very focussed in most of my bike sessions helped and this is something I’m working to improve in my current training. Clearly swimming lots with a squad paid dividends too that sort of short, intense work built the speed I needed. If I take anything away from this it’s just how important those last two points are – squad swimming (at the least quality pool work at high intensity) and focussed bike work. You don’t need lots of it, but what you do have has to be good. I’ll certainly be more focussed in ensuring athlete’s I coach for long course racing are able to hit their hard sessions hard. Hopefully some of them read this and will appreciate the benefits to be gained from the turbo sets they’ll have over the winter! This isn’t to say there’s nothing to gain from increasing volume, but rather to emphasise whatever volume you use you need to have a portion of hard work in there. I’m going to revisit this area to look at the data from 2008 and 2009 where I trained a lot more at times. It’s a demonstration in diminishing returns, but also the need to keep control of the details and the benefits of a cumulative training load.